Smith and David Warner, who are now serving year-long bans for their involvement in the ball-tampering fiasco are eligible to return on March 29. Reports suggest Smith might even sit out of the World Cup, due to the more serious nature of his injury, and might concentrate exclusively on getting ready for the Ashes, beginning in August. With the full summer of Test cricket behind them, Cricket Australia has redirected all efforts for defending the World Cup title, with white-ball contests in India and UAE (against Pakistan) rounding off their preparations. "I'm happy now that we've got this (Sri Lanka series) out of the way and I can put everything into it because every Australian cricketer can't wait to go and play an Ashes series, particularly in England". Only Warner is likely to play that series, though, with Smith needing to recover from a major surgery on his elbow. "They're going to need to get some cricket before coming back into the squad". 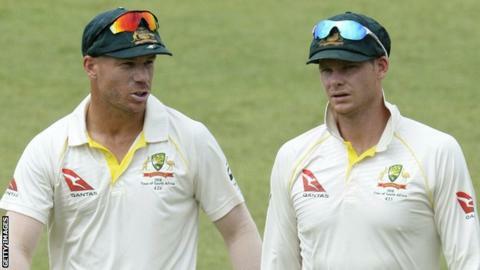 Steve Smith and David Warner will not be rushed back into the Australia side as soon as their bans expire next month. However Smith's team has refuted any such claims, stating that once the former Australian captain's brace comes off the intent will be that he plays the IPL, World Cup and then the Ashes. It's all part of the management. Cricket Australia has remained tight-lipped about the matter and instead issued a non-committal statement in this regard. Smith is eligible to represent Australia from March 29 but his injury will prevent him from getting the match practice coach and selector Justin Langer said he wants before recalling him to the national side for the games against Pakistan. Langer, who earlier this summer described Australian cricket as resembling a dysfunctional family in the wake of the Sandpapergate scandal, said the "reintegration" of Smith and Warner has already well and truly began. "We know there are a lot of good players and there are only 15 spots for the World Cup", he signed off. That's how important they are to this team, as I see.